March 2003, eating a hot dog from a vendor near my hotel in Kiev, Ukraine. Lots of cabbage on top, kinda like coleslaw. Not my proudest world culinary moment. I hardly remember any of the food eaten on that Trans-Siberian trip, but that hot doggy thing under a streetlight at dusk still sticks. I remember deciphering the Cyrillic to make out hot dog (Хот-дог), proud of my linguistic ingenuity. Wherever I have traveled, I seem to remember most the foods of other ethnicities than the one which surrounds me. Bicycling around the Netherlands in a half daze, eating shawarma at Utrecht’s Vredenburg Market. That’s when Middle Eastern food first got on my radar. My first take out order while studying in York, England – egg foo young from a nearby Chinese joint. The jury is still out on that one. Here in Old Nippon, land of soba and sushi, my true pleasure palace has been Taj Mahal, found in the basement of the Sapporo Factory shopping complex. While the kitsch of their interior ambiance might be overwhelming for some, the naan is made my a skilled artisan and keeps me coming back. Nothing repulses me more than the ubiquitous Japanese curry restaurant, and I have done everything in my power to avoid them for almost a decade. Even worse, an “Indian” curry place run by Japanese. That’s a tough one to wrap my taste buds around. Nope, I seek out the real thing every time. Legit Indian food, with a Bollywood soundtrack in the background (at a Japanese price point unfortunately). Which brings me full circle. The other day my wife swung by Kaldi and picked up a bag of Grona Animal Crackers, straight from the Ukraine. The Ukraine to Japan food export scene can’t be that strong – this might be kismet! That’s a Turkish word. 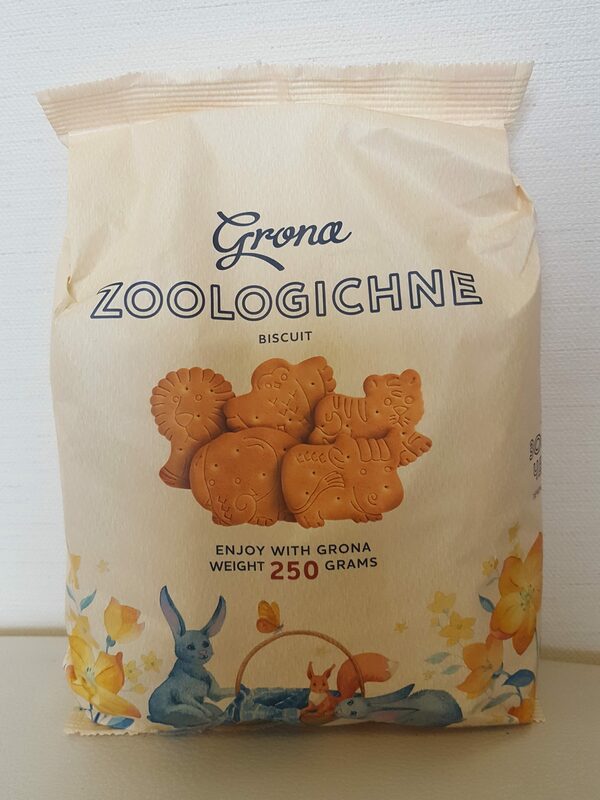 Grona’s Zoologichne biscuit – a Ukrainian animal cracker – available in Japan!